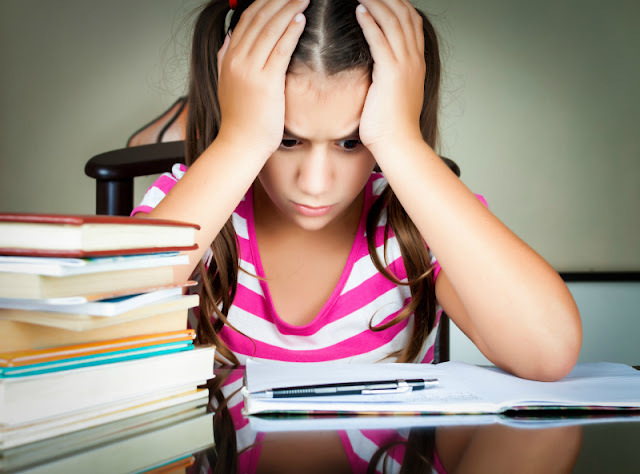 Home » gifted » middle-school » parenting » Why Does It Have to Be that Hard??? Sometimes I feel that I have a post-traumatic stress disorder after years of advocating for Smarty's needs in her public school. And here we go again this year. I consider us very lucky. We are sitting pretty in an upper-middle class neighborhood in San Jose. Our school district is considered to be a "good" district - with old but safe schools, with experienced teachers, with active communities. Most families we befriended are similar to us in educational background and values - many are also first generation immigrants raising their children in US and willing to be partners in their children's education. So I have to ask myself, why does it have to be so freaking hard to have my child's needs met in the best school of our district? This year, after so many years of Smarty teaching herself math on her own through Khan Academy, we finally have a really good math teacher. Smarty really likes him and is eager to please him. There is only one "little" problem. She does not need to do much to please him, because she knows everything in the curriculum of the seventh grade. To my surprise, she also became really good in showing her work, so even that "area of improvement" disappeared once she realized that with more complex problems it does pay off to show her work. This entire month, she did not lose a single point in graded math assignments. The same cannot be said about her other subjects where she still gets mostly A grades, but it's not always a perfect A+. And we have to ask ourselves this, "Will she really benefit from being an A+ student while in fact learning nothing new in an entire year?". The reason why I say "nothing new" is because this teacher does not allow any other material in the classroom - everything that the students are doing is given by him and designed to be "consumed" mostly through group work. Last year, our principal promised that the new math teacher will evaluate Smarty early in the year and will work out the plan for her. We have made an appointment with him to talk about this plan, but, even before we walked into the room, both my husband and I knew what he was going to say. Basically, his hands are tied by his curriculum, and, while he acknowledged that Smarty is "ahead", he said that in his classroom he is teaching 7th grade math. He thinks that she would benefit from this year by developing her social skills and working with others. Interestingly, this is what we hear since Smarty was in kindergarten - that, while her academic skills are advanced, her social skills will be greatly enhanced throughout the year. And, to a degree, they are, partially through a simple fact of growing up. But, if I believed that being in this particular classroom somehow would improve her social skills and taught her how to fit in better with her classmates, I might have chosen it. After all, learning social intelligence is more important than losing 1 year of math advancement. Only... I don't think it works quite that way. I believe that she needs true challenge, stimulating discussions, and intellectual peers to increase her social skills. And she is not going to get that sitting in the classroom doing, however happily, what she already knows. So now we wait for another meeting with our principal to discuss what the options might be. And, frankly, right now we don't see a lot of other options than to look into private schools options for the next year. I still believe in public education, but not here, not in our little district of California, where the only goal seems to be that elusive equity and closing the achievement gap. I feel that our district leaders fail not just my daughter, but also 37% of her grade mates who tested as exceeding expectations of the 6th grade. These kids need to move faster, and this opportunity is denied to them in the name of equity. I expect the flight will continue until the change is made in the district to invest resources not just into the kids who struggle, but also into kids who excel beyond grade levels. Mind is a terrible thing to waste. Are you happy with your children's educational situation? It's working for us this year, although Johnny could certainly learn more in math. The benefit of homeschooling is you can learn as much as you like. The U.S. education system is designed to deliver a level of basic competency in all subjects. It is not, sadly, about making the most of each child's potential. I have followed your blog for a while and enjoy it. I have a gifted son who also in 7th grade but in the correct grade for his age. We have faced similar challenges with respect to his math education as since third grade he tests 99% on achievement tests for 2-3 grades up. Oh I so understand where you are coming from. 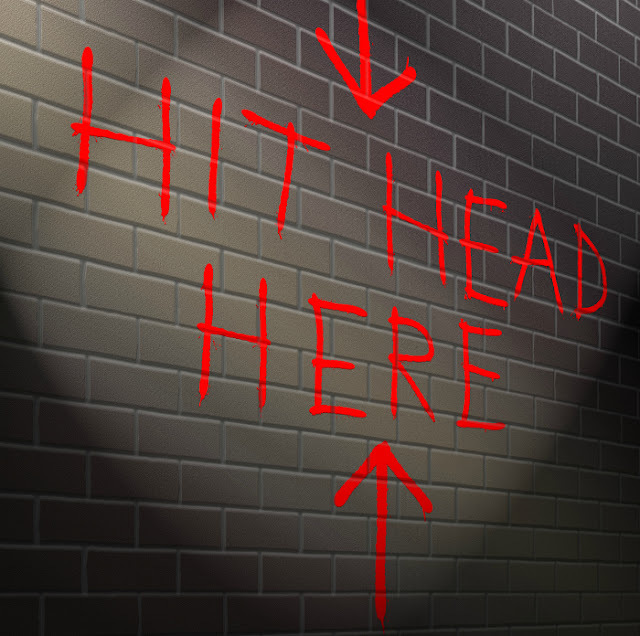 And loved the 'hit head here' wall. I wish I had a wall to hit - sort of. What I have is more of a dense fog, where I can't really approach any one person or entity. I have just chanced upon your blog so I don't know more about your class, but I do know it won't have 50 children under one teacher, whose sole responsibility is to finish the prescribed curriculum in time for the exams. There is nothing imaginative about teaching - in any subject, and no, not even the kids who struggle are getting enough help. Trying to talk to a teacher or the principal about teaching methods or topics or anything really to stimulate the mind, is basically asking for a kick in the pants of the what-are-you-talking-about-get-lost variety. The entire system is flawed, but perhaps, more importantly, it is the school commitment which is lacking. I try very hard to not let the schooling interfere with education, but I am afraid I have been losing at it as the total time needed by the school increases... By the way, I am in India.